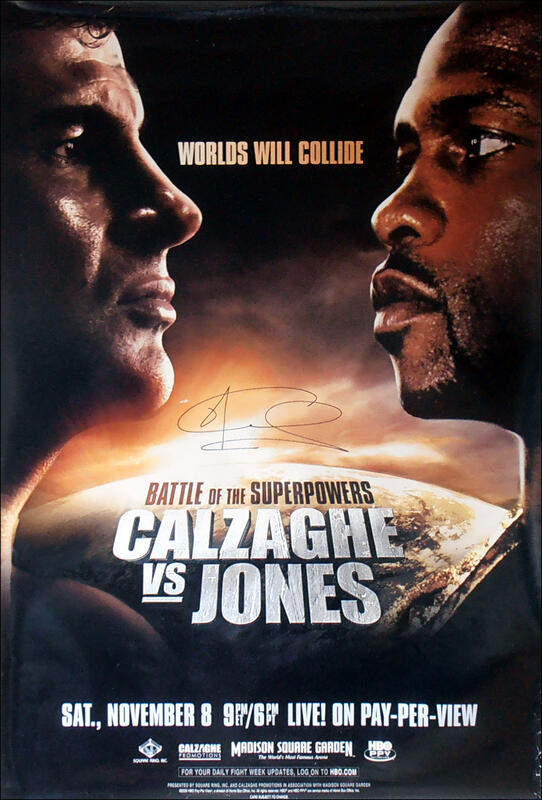 Description : Here we have a Joe Calzaghe autographed original full-size HBO boxing pay per view poster for Joe Calzaghe's last ever career fight against the legendary Roy Jones Jr. On 8 July 2008, after Calzaghe's split from Frank Warren, it was officially announced that the 39 year old, Roy Jones Jr., and Joe Calzaghe had reached an agreement to fight for The Ring Light Heavyweight Championship in New York City at Madison Square Garden on 20 September 2008 on HBO PPV. After Calzaghe injured his right hand in training,the fight was postponed,with 8 November being set as the new date. Calzaghe was put down by an accidental forearm in the first round. 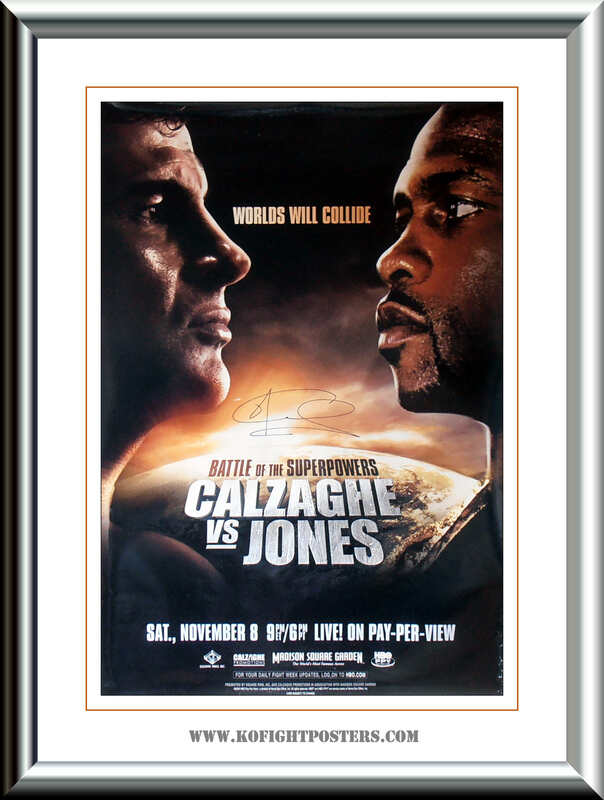 Two close rounds followed before Calzaghe took control of the fight. In the eighth round, Jones sustained a cut over an eye, nearly forcing a stoppage. All three judges' decisions were 118-109 for Calzaghe. These HBO/PPV closed circuit posters are not made available for public consumption & can only be sourced from a participating PPV outlet hence the scarcity as once the televised event if over, then these posters go straight to skip. 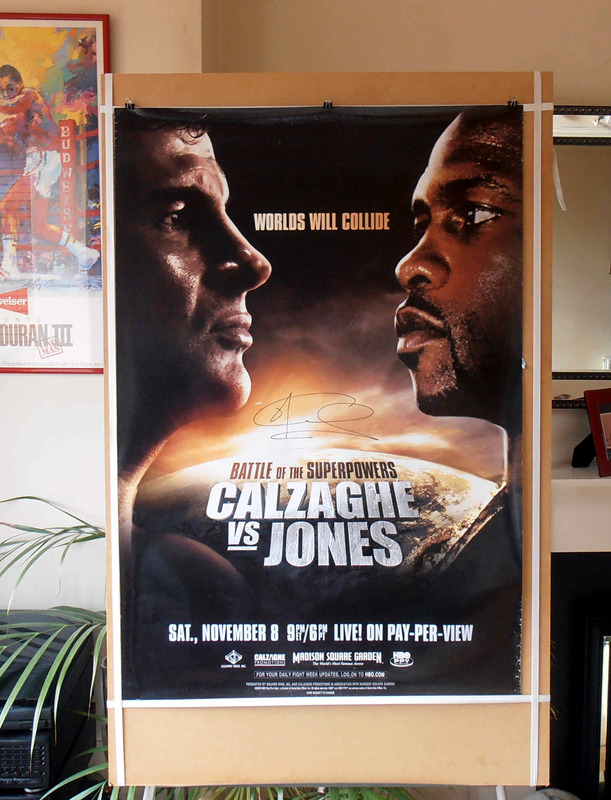 This authentic Joe Calzaghe autographed HBO PPV poster comes with a lifetime & beyond letter of guarantee of authenticity from KOfightposters.com. Condition : Very Good/minor handling & edgewear/tiny spot of paper loss just above the signiture/framed 4 display purposes only!